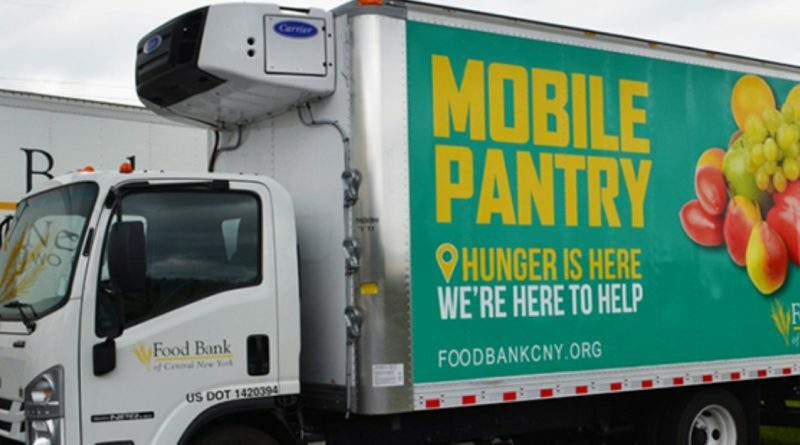 Food Bank of Central NY will be holding a mobile food pantry distribution in the Library’s Parking Lot. Anyone in need of food assistance is encouraged to attend and receive a free box of food. Boxes will be limited to one per household and will be distributed while supplies last. There are no income requirements for families and individuals wishing to receive food. The pantry will begin processing food packages to be handed out at 3pm. The Library will NOT OPEN until 3pm. Please feel free to arrive early but plan to wait outside until 3pm. At that point you are welcome to come inside and get a processing number. Feel free to check out some cookbooks available on loan from the library, look at recipes online, and take a look at displays from the Food Bank and from Cornell Cooperative Extension. Monday – Friday, 8:00AM – 4:30 PM. Food Bank of Central New York is a not-for-profit organization working to eliminate hunger through nutritious food distribution, education, and advocacy in cooperation with the community. We partner with 250 emergency food programs in the counties of Cayuga, Chenango, Cortland, Herkimer, Jefferson, Lewis, Madison, Oneida, Onondaga, Oswego, and St. Lawrence.